Community policing is a philosophy and organizational strategy that expands the traditional police mandate of fighting crime to include forming partnerships with citizenry that endorse mutual support and participation. The first textbook of its kind, Community Policing: A Contemporary Perspective delineates this progressive approach, combining the accrued wisdom and experience of its established authors with the latest research-based insights to help students apply what is on the page to the world beyond. 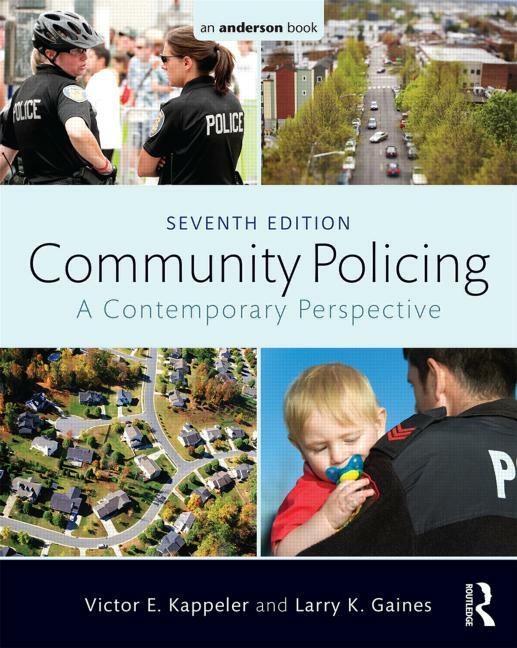 This seventh edition extends the road map presented by Robert Trojanowicz, the father of community policing, and brings it into contemporary focus. The text has been revised throughout to include the most current developments in the field, including "Spotlight on Community Policing Practice" features that focus on real-life community policing programs in various cities as well as problem-solving case studies. Also assisting the reader in understanding the material are Learning Objectives, Key Terms, and Discussion Questions, in addition to numerous links to resources outside the text. A glossary and an appendix, "The Ten Principles of Community Policing," further enhance learning of the material. Victor E. Kappeler, a former police officer, is a Foundation Professor and Associate Dean of the School of Justice Studies at Eastern Kentucky University. He is recognized as a leading scholar in such fields as policing, media, and the social construction of crime, and police civil liability, among other related fields. Dr. Kappeler continues to provide in-service training for police officers and is well published in professional areas of policing. Among many other honors, Kappeler received the 2006 Cabinet for Justice and Public Safety Award for Academic Excellence and the 2005 Outstanding Criminal Justice Alumnus Award from Sam Houston State University, where he earned his doctoral degree, and the Lifetime Achievement Award from the American Society of Criminology’s Division on Critical Criminology. Larry K. Gaines is Professor and Chair of the Criminal Justice Department at California State University, San Bernardino. He served as the Executive Director of the Kentucky Association of Chiefs of Police for 14 years and has consulted with a variety of police agencies in Kentucky, Ohio, Tennessee, Georgia, and California. Dr. Gaines has served as Secretary, Treasurer, and President of the Academy of Criminal Justice Sciences. He has received many awards, including the Founders Award from the Academy of Criminal Justice Sciences, the Outstanding Educator Award from the Southern Criminal Justice Association, and the Outstanding Service Award from the Police Section of the Academy of Criminal Justice Sciences. In 2001, he served as a member of the California POST Committee that developed police training curricula for racial profiling.